The correlation between orientation ordering of polymer chains in the bulk of polymer film and at the polymer-liquid-crystal (LC) interface has been studied to determine it's role in LC alignment. The bulk and surface ordering of polymer were investigated by null ellipsometry and x-ray reflectivity, respectively. Two kinds of liquid-crystalline polymers were used; side-chain azopolymers with azochromophores containing hydrophobic OC(4)H(9) alkyl chain (P1) and strongly polar NO(2) group (P2) as the end substituents. 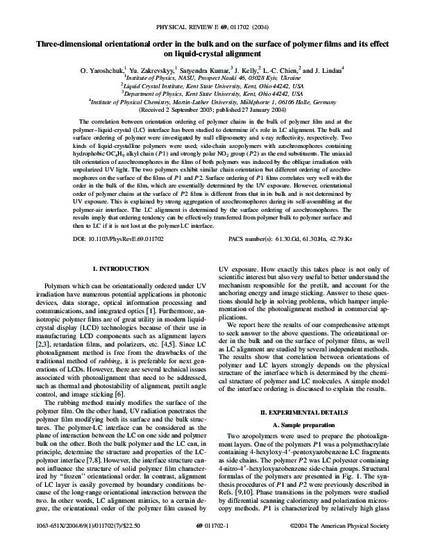 The uniaxial tilt orientation of azochromophores in the films of both polymers was induced by the oblique irradiation with unpolarized UV light. The two polymers exhibit similar chain orientation but different ordering of azochromophores on the surface of the films of P1 and P2. Surface ordering of P1 films correlates very well with the order in the bulk of the film, which are essentially determined by the UV exposure. However, orientational order of polymer chains at the surface of P2 films is different from that in its bulk and is not determined by UV exposure. This is explained by strong aggregation of azochromophores during its self-assembling at the polymer-air interface. The LC alignment is determined by the surface ordering of azochromophores. The results imply that ordering tendency can be effectively transferred from polymer bulk to polymer surface and then to LC if it is not lost at the polymer-LC interface.